Welcome to our February page where our love grows larger and larger with each story, song, and work of art. Your students will become very involved in this fun story. Encourage them to wonder why the hearts are sad after Valentines Day. Don't tell them. Make note of the hearts each day during February. 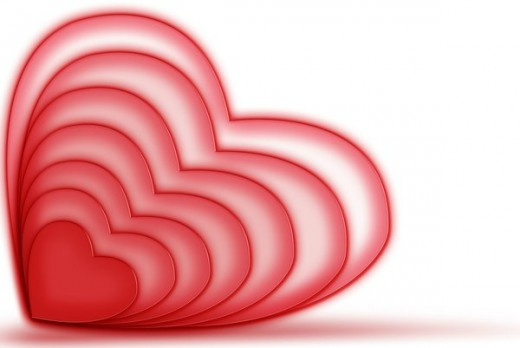 You will need three fairly large red hearts. Draw a happy face on one side, a frowny face on the other side of each heart. Post the three happy hearts on board where children will notice them. 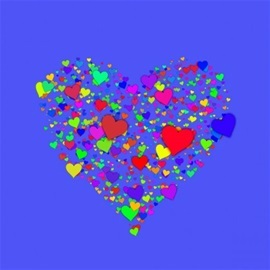 Mention to them how happy the hearts are to be included as decorations in your room. 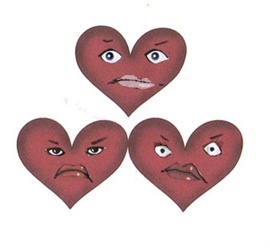 Without explaining why, turn the hearts over to their sad faces the day after you have your valentines’ party. Encourage the students to notice that they are no longer happy, but tell them why. Let the children wonder about it through the rest of the month. Once upon a time there were three happy hearts. They lived on the bulletin board in Ms. Millie classroom. A calendar hung beside them. The heading on the calendar read “February”. It had a red X on the number 14. Ms. Millie showed her class the three happy hearts and then made note of the number 14 on the calendar. “This is Valentines day. On this day we will have our Valentines party,” she told her class. The three hearts watched Ms. Millie mark off the calendar days one by one. When Valentine’s Day came the children exchanged Valentines. The three Hearts were as excited as the students. But after the party Ms. Millie drew Xs over each February day until there was only two days left. The hearts began to worry. “What will happen to us when February is gone?” Heart One wondered. “Not the trashcan!” cried Heart Three. When they opened their eyes they had turned green. “Now Ms. Millie won’t throw us in the trash!” shouted Heart Three. “That is it!” shouted Heart One. “Good idea. 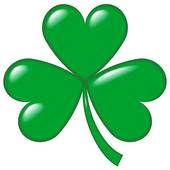 We’ll become a shamrock.” laughed Heart Three. The three hearts moved together, their sides touching. Heart One pulled a green stem from a paper flower on the bulletin board. He placed it on their bottoms. “Now we look like a shamrock leaf!” he exclaimed. The next morning Ms. Millie came in early to decorate her room for the new month. The Hearts held their breaths as she took down all the hearts around the room. When she started to decorate the bulletin board she saw the green shamrock leaf. The Hearts gave sighs of relief as Ms. Millie marked number 17 on the March calendar. She told her class, "On this day everyone should wear something green, and we'll celebrate St. Patrick’s Day." The hearts knew that they would be safe for another month. Action on last school day before March. Putting the green hearts together to become a happy Shamrock for March's room decoration. Draw a happ y face on each heart. Our focus on emotions this month is of course, love. Love of self, and love of others. Love of self builds self-esteem. Our featured Puppet Dialogue helps to build your students the self-esteem they will need to succeed in their lives. My other story, Hurshal Lost, tells of a child's first love, his or her precious stuffed toy. The activities for this story will instill a special pride in your student of the 'love' bear he/she makes. Some of my students kept their bears until they were grown. PUPPET DIALOGUE: I wish I Were Never Born. TEACHER: (Hold puppet’s head down. look over the puppet.) You look unhappy this morning. Is something wrong? LINDY: Everything is wrong! I woke up with a headache. I didn't have any milk for my breakfast cereal. I forgot to prepare for this morning’s story time. I wish I had never been born. TEACHER: It would be a different world if you hadn’t been born. LINDY: Well, no one would miss me. TEACHER: You are right. We couldn’t miss you if you hadn't beenborn because we would never have known you. We have to knowsomeone in order to miss them. But since you have been born and youare our friend we would miss you if you were not here. LINDY: Would you really miss me? TEACHER: Of course, we would. I remember the first day we met you, when I introduced you to our class. Don’t you remember? LINDY: Yes, I remember. I was so shy of meeting the children. TEACHER: Do you remember how the children made you feel betterby singing with you? After that whenever you were around us youmade us all feel good with your songs and stories. TEACHER: We all feel that way once in a while, Lindy, but wehave to remember that each of us was born for a reason. We each have special things that we can do. You were born to share your stories andsongs with us. If you hadn’t been born we wouldn’t be able to hear your stories and sing your songs. LINDY: You mean if I had not been born I wouldn’t be able to be herewith you and the children? TEACHER: That is exactly what I mean. You were born so youcould be here with us and make us laugh and sing. TEACHER: (Laughing) Puppets can’t dance. They don’t have legs. LINDY: I can if you’ll help me. TEACHER: Do you really want to dance? LINDY: Oh yes. I was born to boogie--to twist--to do the hop—tocut the rug--to trip the light fantastic. Where’s the music? 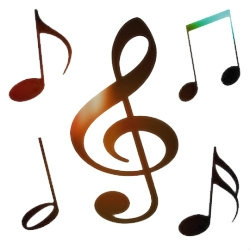 Where's themusic? TEACHER: Well, if you think you can dance I have some musicright here. Come on everyone. Lets dance with Lindy. LINDY: (Out of breath.) That was fun. It made me tingle all over.It’s so good to be alive. I’m glad we all were born. But now, I’m tired. Ithink I’ll take a nap. TEACHER: I hope you will come back tomorrow because we wouldreally miss you if you didn’t. LINDY: Oh, I’ll be back. I can’t wait until I tell you my next story.Good-bye everyone. On their way home from vacation Anthony’s family stopped at a motel for the night. Anthony hugged his teddy bear, Hurshal, as he fell asleep in the motel bed. He was still asleep when Mom carried him to the car early the next morning. He slept all the way home. Wake up, we are home,” Mom called as they drove into their driveway. Anthony was glad. Hurshal and he didn't like to ride in cars for such a long time. He reached for Hurshal. His teddy bear wasn't there. He looked on the floor -- No Hurshal! "I can't find Hurshal," he shouted. Anthony started to cry. Where was Hurshal? Mom took his hand. “Don’t worry. We’ll find your bear. He’s probably packed away in the luggage somewhere. We’ll look when we get everything in the house.” But when all the suitcases and Anthony’s back pack were emptied Hurshal was nowhere to be found. Mom looked at Dad. "Honey, didn't you get Hurshal from the motel?" "I thought you picked him up,” Dad answered. Anthony shouted, "You left Hurshal at the motel?" Anthony ran out to wait on the curb by the mailbox. Soon Dad sat down beside him. "Hurshal won't be here for a couple of days, you know. It takes time to mail a package somewhere." "But Hurshal can't sleep without me,” Anthony sobbed. Daddy handed Anthony his new blue bear Grandma had given him for Christmas. "Will this bear do until Hurshal gets home?" "No!" Anthony threw the bear on the ground and stamped his foot. "I want Hurshal." "I'm sorry but you will have to do without Hurshal for a couple of days,” Dad said. That night Anthony couldn't sleep even when Mom rocked him. "Let’s talk about Hurshal," Mom said. "What do you like about him?" "I like the way he smells, and his raggedy ears and his wrinkly nose. "Mom pulled Anthony’s nose and laughed, “Just like yours?” She put Anthony into his bed and pulled the quilt up to his chin. "Think happy thoughts about Hurshal and you'll be asleep before you know it." Mom was right. Anthony thought of Hurshal and went directly to sleep. Two days later when the package came Anthony tore off the paper. Under the paper was a shoebox. He was afraid to lift the lid. What if it was someone else’s bear in the box? Open the box,” laughed Mom. Slowly Anthony lifted the lid. His bear looked up at him with his teddy bear smile. He hugged Hurshal. "I'll never let you get lost again," he promised. And he never did. 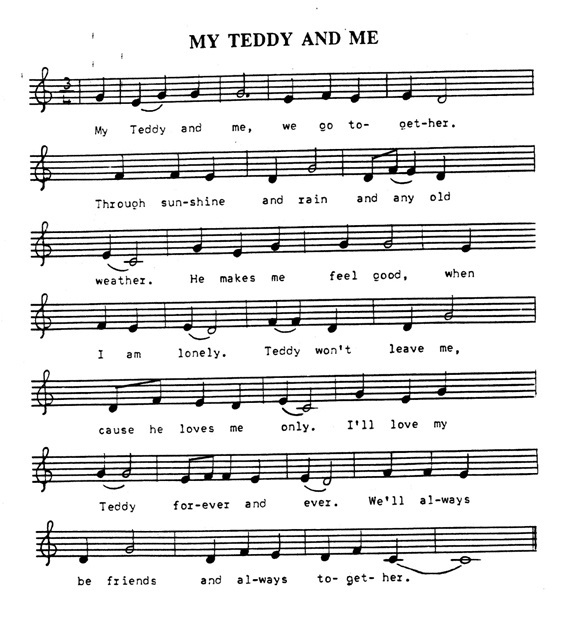 To make Hurshal, the teddy bear, cut out two bears shaped as in the example. Use felt and let the student choose the color he or she wishes. Glue on felt eyes, nose, and a strip of red yarn to make mouth. You can add buttons also if child wishes. When all is dried, place the pieces together, and glue around the edges of the neck, arms, body and legs. (leave top open.) When dry punch holes around the edges and let child sew the bear together with yarn from bottom of ears, weaving the yarn under and over. ( Like a flower growing up out of the ground.) Save enough yarn to go up over the ears and head. Do not tie the yarn yet. Carefully stuff the bear with small pieces of cotton batton pushing it into the arms and legs. Let the student decide if his/her bear is a chunky bear with lots of cotton or a skinny bear with less cotton. When stuffed close the top of the bear, glue edges, and continue to sew, Tie the left over yarn into a neat bow at the top, or if the student doesn't want a bow, tie it tight and clip off the left over. You can also make a neck bow by placing yarn or ribbon around its neck. Now have the student name the bear. The more choices the child has in making the bear, the more the bear will belong to him/her. Some of my students kept their bears until they were grown. Photo of the finished "love" bear. February is a good month to practice cutting with sissors and what is easier than to cut out hearts. 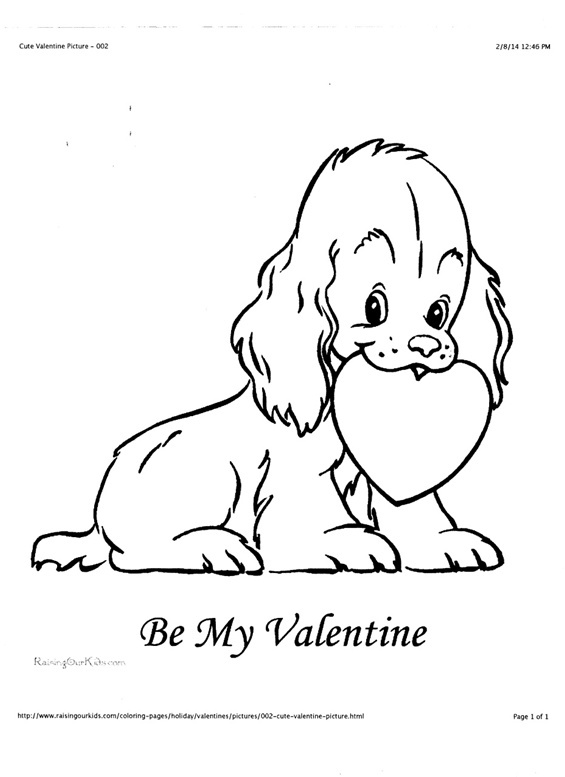 Fold a square piece of paper, have student draw a half heart with the flat edge of the 1/2 heart on the fold. Lay several sizes cardboard half hearts on the art table so the student can draw around them. Keeping the paper folded, have student cut out the half hearts. When open of course they become hearts. 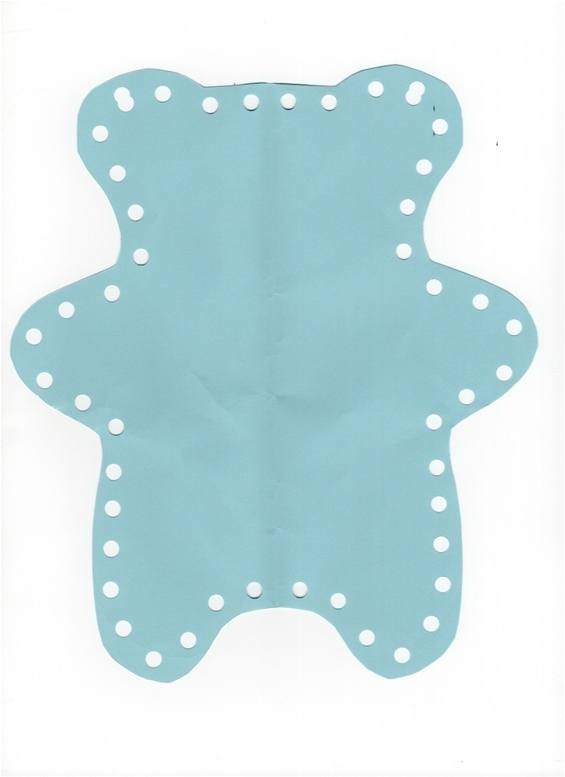 Have glue sticks available and a large heart drawn on light blue paper, Have children make various colors and sizes of hearts to glue on the inside of this base heart, making a colorful heart display. And I’m taking in my sleep about you! Doodle doodle do do, Doodle do do, Doodle doodle do do, do. 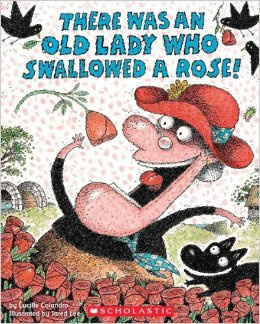 If you haven’t read the classic, "The Old Lady who Swallowed a Fly", You should have it on your list to read. Ridiculous, but so funny your students will ask for it over and over. Now author, Lucille Colandro has another one out. That lovely old lady has returned just in time for Valentine's Day. Now she's swallowing items to make a very special gift for her valentine! 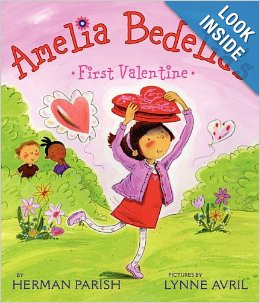 'Amelia Bedelia's First Valentine' by Herman Parish. Being a long time fan of the Amelia Bedelia's series about the lovable, literal-minded housekeeper written by Peggy Parish, I check it out. Herman Parish, the nephew of Amelia Bedelia's creator, Peggy Parish, (who passed in 1988), has continued in his aunts footsteps, bringing Amelia Bedelia to a new generation of readers. This new series of books show us what Amelia was like as a child. Check out more of his books at his Amazon author's page. 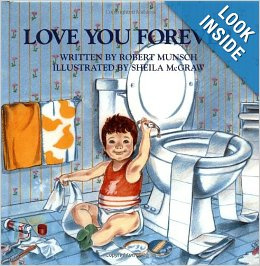 This classic book should be in every pre-school library. The mother sings to her sleeping baby: "I'll love you forever / I'll love you for always / As long as I'm living / My baby you'll be." She still sings the same song when her baby has turned into a fractious 2-year-old, a slovenly 9-year-old, and then a raucous teen. So far so ordinary--but this is one persistent lady. When her son grows up and leaves home, she takes to driving across town with a ladder on the car roof, climbing through her grown son's window, and rocking the sleeping man in the same way. Then, inevitably, the day comes when she's too old and sick to hold him, and the roles are at last reversed. Each stage is illustrated by one of Sheila McGraw's comic and yet poignant pastels. Wonderful ideas to incorporate into caring for my grandlove! Thanks so much! Look forward to more!